After that first winter of wearing dressing gowns in bed and cuddling hot water bottles it was clear that we needed to do something to make the house warmer. The fact that frost never stayed on our roof identified it as the problem. For many houses, fitting loft insulation is a straightforward job with a quick payback. For old houses and those with living accommodation in the loft space the process can be complicated and expensive. It has very old, wobbly rafters which preclude the use of a rigid insulation panel such as celotex. I was also conscious of not upsetting the moisture equilibrium of the house by introducing non-breathable materials that could lead to condensation. So I called in Marianne Suhr from the Old House Consultancy to devise a roof insulation strategy for us. 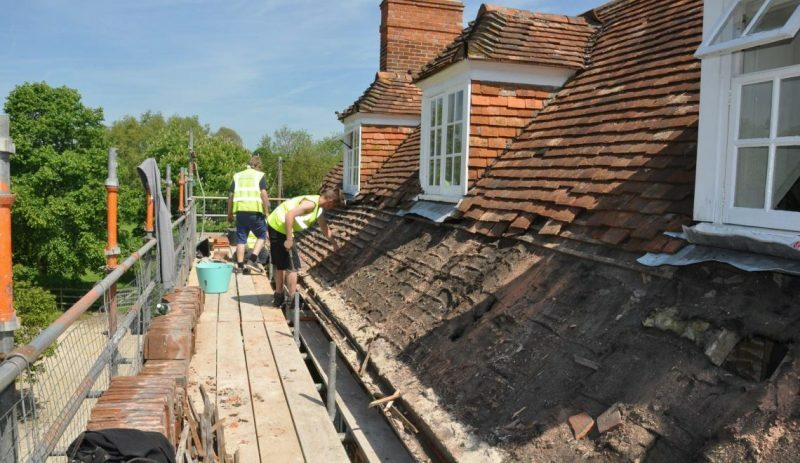 It was obvious from the start that we were going to have to remove all the clay tiles and insulate from above rather than below. Other problems to resolve were balancing U-value, airtightness and breathability. Marianne painstakingly laid out the options, including TLX Gold and wood fibre board. The system I opted for involved laying a breathable, airtight membrane, Intello Plus, over and between the rafters to create troughs for Steico Flex quilt to sit in. Solitex Plus roofing membrane was then laid taught across the rafters and fixed down with counterbattens. The clay tiles were then relaid. All materials were sourced from Eco Merchant. Although I could have achieved a better U-value than 0.39 using less eco-friendly materials I decided that, for our house, the prevention of draughts and maintaining breathability were the priorities. The beauty of Steico Flex is that it is semi-rigid so it can be flexed to fit snugly between wobbly rafters thereby eliminating draughts. It’s also breathable so that water vapour, which gets constantly produced in a house, can escape. Steico Flex is made from saw mill residues from sustainable sources and, unlike other insulation panels, contains minimal amounts of formaldehyde and PMDI binders. Intello Plus draped over the rafters (white), Steico Flex wedged in between (brown) and Solitex Plus roofing membrane on top (blue). The underside of the roof showing how irregular the rafters are. The Steico Flex fits snugly between them and prevents draughts. Finally, in some spaces above the flat ceilings, we laid 240mm of Thermafleece CosyWool for added warmth. This is a great British product made in Yorkshire using 75% sheepswool and 25% recycled fibres. It is impregnated with borax to make it fire retardant and resistant to moths. Thermafleece CosyWool laid on one of the flat ceilings. One sweetener to this project was that because the works were solely for energy efficiency purposes we were eligible for reduced VAT at 5%. Two winters on we are as toasty as ever and hygge-ing our way through these dark February evenings. Although my husband complains that the cost was equivalent to buying a flashy car, I know he’s secretly grateful that he’s warm and cosy under a roof insulated with sheepswool and sawdust!